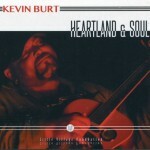 Kevin Burt’s baritone mix of soul, grit and warmth evokes the likes of Lou Rawls and, especially, Bill Withers. And the Iowa-based singer/guitarist/harmonica player’s gut-driven lyrical clout doubles down on the Withers comparison, jam-packing this set with airplay-worthy fare. Standouts in a strong set include “Day Day”, “Thank You” and the ultra-steamy “Never”. Solid, quality backup throughout.